and freestanding emergency care means life-saving help is always nearby. We offer emergency care both at UCHealth hospitals as well as at various freestanding emergency care locations throughout the Front Range. You’ll find the same highly qualified emergency medicine doctors and specially trained emergency nurses at both, and at the same cost. may be having a heart attack. 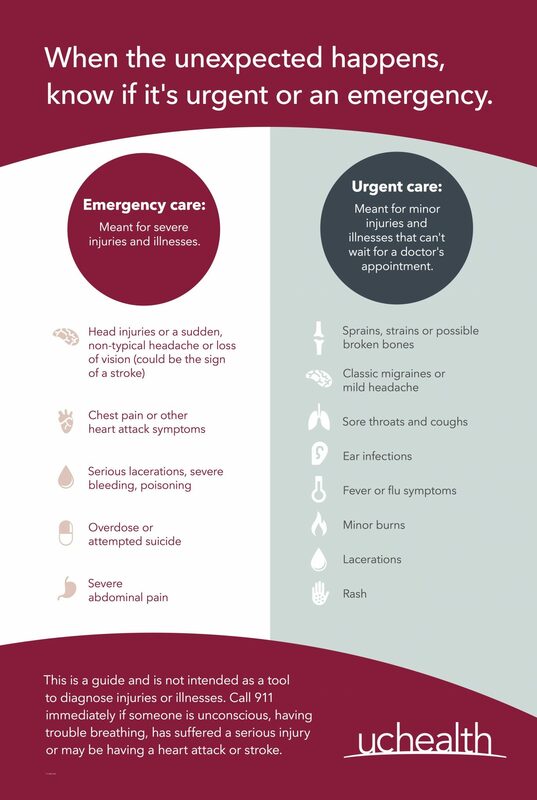 Many conditions can be treated as quickly and more affordably at a UCHealth urgent care location. Freestanding emergency care locations may be closer to you and more personal because they are smaller, with an average of eight beds. Freestanding emergency care locations can stabilize and treat true emergency conditions—they are not urgent care facilities. For cuts, sprains, possible broken bones, migraines, sore throat or the flu, contact your primary care physician. If you can’t wait, visit one of our urgent care locations. care for critically injured patients.